1.One-click access: The sleek and compact design with improved ergonomics allows you to access all essential controls under one thumb. Keep it simple with this effortless remote. 3. Lightweight design, easy to use, excellent and practical design! 4. It will enter sleep mode while you are not use it, which will be energy-saving and prolong the lifetime of the remote control. 100% Satisfaction Guarantee: 30 days Return & Refund policy WITHOUT hassle; get the full refund quickly or free replacement if you aren't completely satisfied; Free lifetime technical support and 12-month manufacturer's warranty. 1.Tailor Making: Fit for your Playstation 4 systems. 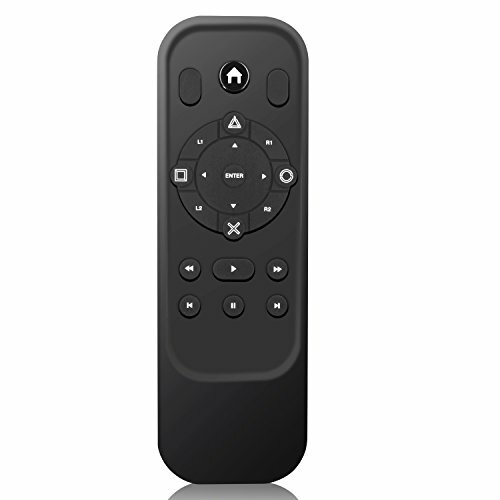 With this Media Remote, you can easily control your entertainment. 2. Wireless connection: Use Wireless to control your ps4 system, more convenient and quick. A PS4 Media Remote perfect controller. 4. Dedicated PS4 Buttons- includes the most important buttons for navigating system menus and apps, including operation button, Options and PS buttons. 5. Lifetime Warranty: 30 days Return & Refund policy WITHOUT hassle; Get the full refund quickly or free replacement if you aren't completely satisfied; Free lifetime technical support and 12-month manufacturer's warranty. If you have any questions about this product by IVSO, contact us by completing and submitting the form below. If you are looking for a specif part number, please include it with your message.